Presented by UCSB Department of Political Science and the Department of Black Studies; co-sponsored by the Interdisciplinary Humanities Center IHC). 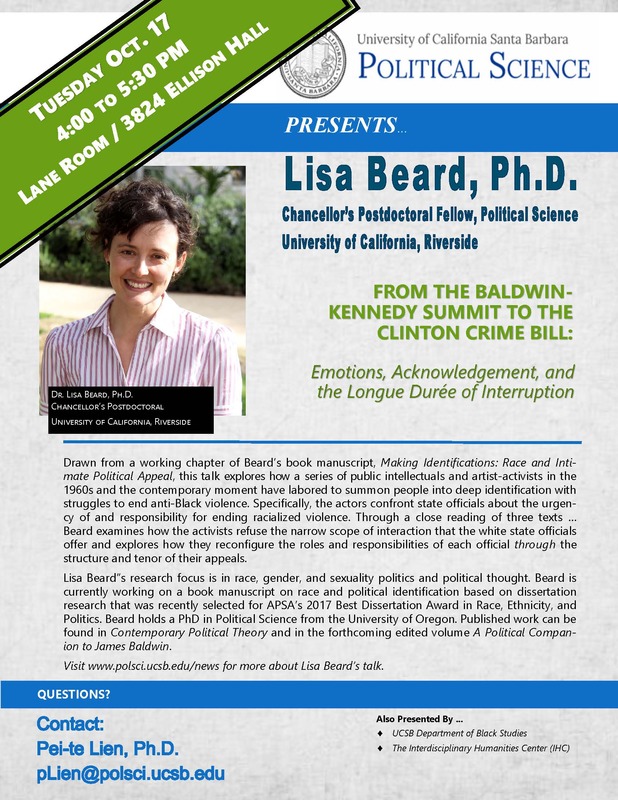 Lisa Beard is a Chancellor’s Postdoctoral Fellow in Political Science at the University of California, Riverside, with a research focus in race, gender, and sexuality politics and political thought. Beard is currently working on a book manuscript on race and political identification based on dissertation research that was recently selected for APSA’s 2017 Best Dissertation Award in Race, Ethnicity, and Politics. Beard holds a PhD in Political Science from the University of Oregon. Published work can be found in Contemporary Political Theory and in the forthcoming edited volume A Political Companion to James Baldwin. This talk is drawn from a working chapter of Beard’s book manuscript, Making Identifications: Race and Intimate Political Appeal, and explores how a series of public intellectuals and artist-activists in the 1960s and the contemporary moment have labored to summon people into deep identification with struggles to end anti-Black violence. Specifically, the actors confront state officials about the urgency of and responsibility for ending racialized violence. Through a close reading of three texts—including James Baldwin’s 1963 telegram to Attorney General Robert Kennedy, Lorraine Hansberry’s statements at the 1963 James Baldwin-Robert Kennedy Summit, and Black Lives Matter organizers Daunasia Yancey and Julius Jones’ pointed meeting with Hillary Clinton in 2015—Beard examines how the activists refuse the narrow scope of interaction that the white state officials offer and explores how they reconfigure the roles and responsibilities of each official through the structure and tenor of their appeals. In the meetings, the activists steer the state officials towards acknowledgement—not as a trite admission or a short-lived performance of recognition, but as the transformative and disruptive political project of undoing disavowal. Baldwin collapses distance, Hansberry maps out a political exercise of “hearing,” and Yancey and Jones wield “feeling” —each as practices of knowledge production that undermine white disavowal and would inform critical political action. Read together, these interventions are a part of a longer history of Black “interruption” of and resistance to white dominated political discourse; a history of radical resistance to the terms of political engagement themselves.